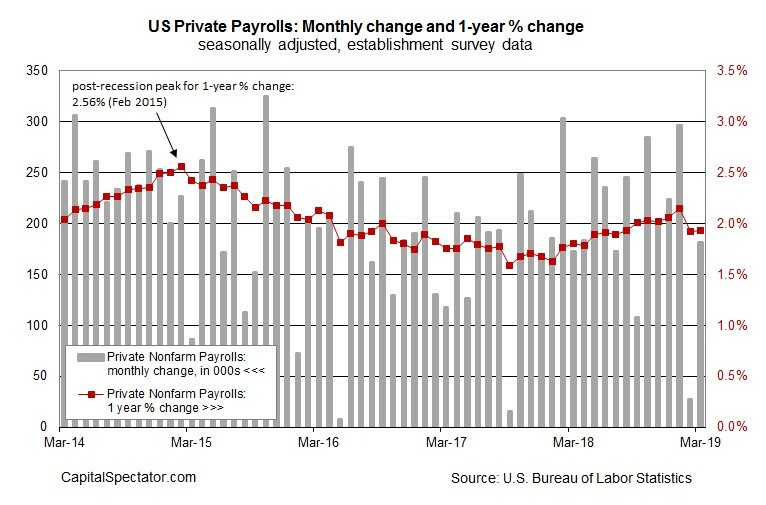 March Labor Report - A terrible February jobs report was only marginally revised higher as it increased from 20,000 to 33,000. Keep in mind, we still have another revision coming next month. By that point, February will be long gone. Investors worried about the 2nd half of 2019 won’t care much. 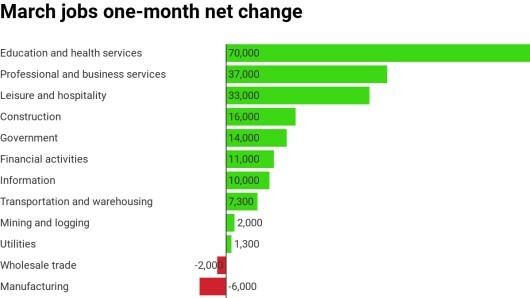 Headline job growth in March beat estimates supporting the record breaking jobless claims data from the week of March 30th. Claims fell from 212,000 to 202,000 which is a cycle low. As a percentage of the labor force, it is a record low. Total job creation in March was 196,000 which was slightly better than the consensus of 170,000. As you can see from the chart below, the 1 year growth rate didn’t improve much from last month. The 3 month average now includes a great report, a bad report, and a slightly above average one. Bad news is there was a big burst in job creation from the government. Private sector job creation was expected to be 168,000, but it was 182,000. That beat estimates, but by a lower amount that the overall number. That’s because the government was expected to have added 2,000 jobs, but it added 14,000 jobs. The chart below shows the job creation in each industry. As you can see, manufacturing lost 6,000 jobs which missed the consensus for 10,000 added. Even though the overall reading was revised higher in February, manufacturing created 1,000 jobs instead of 4,000. That means the manufacturing sector is weakening like the recent Markit PMIs have shown. It’s not a surprise that education and healthcare added the most jobs at 70,000. This industry grouping isn’t sensitive to the whims of the economy. However, in a recession we will probably even see its hiring turn to layoffs. This explains why the BLS report isn’t a leading indicator for the economy. We already know that people are only fired when business is particularly grim. Adding in the fact that the biggest industry won’t fire workers right away gives us another reason why this report doesn’t forecast where the economy is headed. The unemployment rate stayed at 3.8% which met estimates. It is slightly above the cycle low of 3.7%. When the rate increased to 4%, I knew it wasn’t a sign the labor market was weakening because workers came off the sidelines looking for a job. 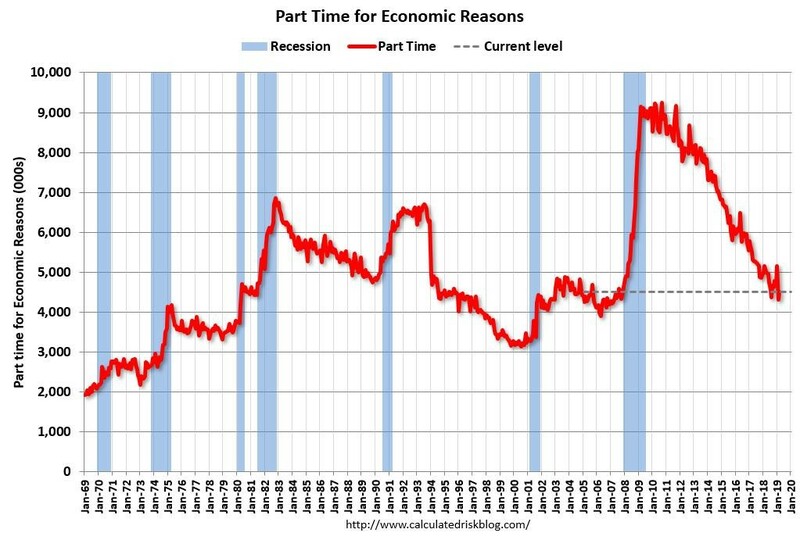 As you can see from the chart below, the number of people working part time for economic reasons fell from 4.499 million to 4.310 million. However, the U6 unemployment rate which includes these workers and marginally attached workers stayed at 7.3%. That matches the cycle low, which is below the 2007 trough, but 0.5% above the October 2000 low. Overall labor force participation rate fell from 63.2% to 63%. However, the prime age labor force participation rate was stable at 82.5%. It’s slightly below its recent peak of 82.6% in January. It’s always interesting to compare it to previous peaks as it tells us how much slack is left in the labor market. Some months it increases very quickly, making some think it will reach previous cycle peaks soon. However, based on historical results, I know it falls occasionally and stays below peaks for a while. It takes 2 steps forward and one step back. It is up 0.5% in the past year. At that rate, it would take 1.8 years to get to the previous cycle high. 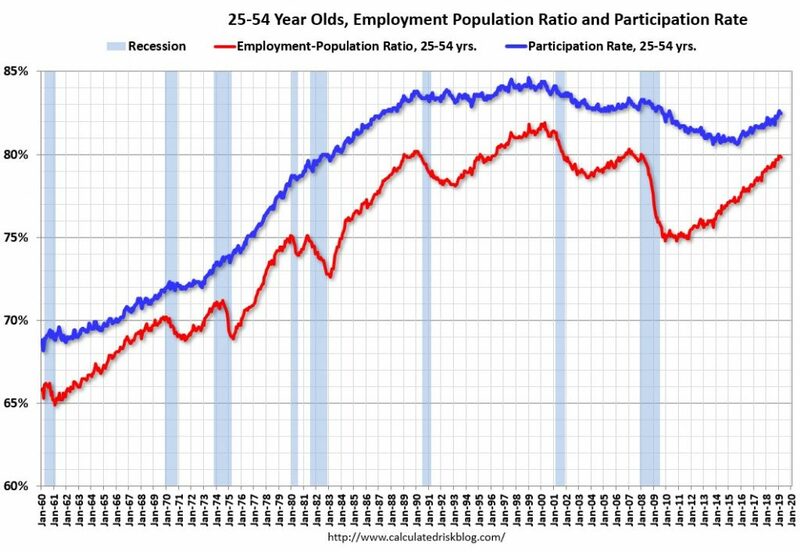 As you can see from the chart below, the prime age employment to population ratio is also below its previous cycle peak. This rate fell 0.1% to 79.8%. January and February were a joint recent peak. Average hourly wage growth was 3.2% which was down from 3.4% last month. The consensus was also 3.4%. That’s why I said this report was perfect. It wasn’t too hot and it wasn’t too cold. It solidified the thesis that the labor market is still solid even if the yearly employment growth rate isn’t at its cycle peak. Last month, average weekly earnings growth slumped because the length of the work week fell. In March the work week rose from 34.4 hours to 34.5 hours which met estimates. As you can see from the chart below, this helped the weekly wage growth rate improve to 3.2% from 3.1%. It is still below the cycle high of 3.6% growth in October. The growth rate has been range bound since February 2018, with the bottom end being 3% and the top end being 3.6%. I don’t expect it to exit that range until the economy resurges in late 2019/early 2020. With jobless claims low and the employment report rebounding from the weak February, it’s clear the labor market is in good shape. 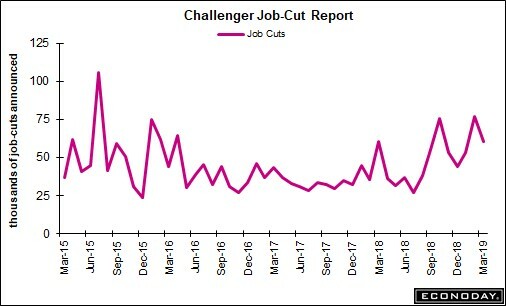 However, the Challenger Job-Cut report doesn’t agree completely. As you can see from the chart below, the job cuts fell from 76,835 to 60,587 in March. However, since this report is volatile, it’s better to look at the quarterly total. In that light, this report isn’t doing well as the 190,140 announced layoffs in Q1 were above last quarter’s 172,601 and 35.6% higher than last year’s Q1. This quarter had the most announced layoffs in 4.5 years and the most in a first quarter since the last recession. We must watch this indicator closely next month. This was a solid labor report as job growth rebounded from February. It shows that even in a modest economic slowdown, the labor market can remain steady. That should keep the consumer spending at a solid clip. Since house price growth has been falling and interest rates have collapsed, the housing market should have a strong spring selling season which should help boost Q2 GDP growth. On the other hand, announced layoffs have been elevated. The ECRI leading index at the start of the year suggested Q2 and Q3 would be the weakest quarters of this expansion.